Hello everyone!! It's Wednesday and that means it's time for this week's Color Throwdown Challenge. I am the hostess this week and now that the kids are back in school and the vacations are over for another year, the summer is beginning to wind down....fall will be here before we know it!!! I really want to postpone the end of summer as long as I can so that's why I picked these bright, sunny, summery colors....I hope you like them and are inspired to play along with us!! My card features stamps and dies from Reverse Confetti and the Sweet Sunday Sketch #234 was used for the layout. The cute little popsicle dies called Let's Chill were cut out of Daffodil Delight and Melon Mambo card stock and embossed with a Dotted Swiss ef. They were popped up on the white scalloped diecut that was cutout with one of the Circles and Scallops dies. The sentiment is from the RC Arrows 'n Elements stamp set and the background paper is from Doodlebug's Sugar Shoppe 6x6 paper pad. The buttons, hemp cording, ribbon, and sewing finish it off. 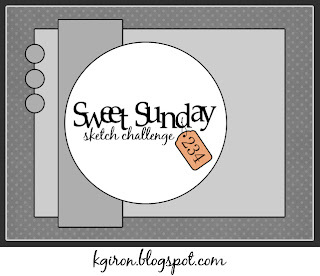 Remember, you don't have to use the exact colors.....use what you have as long as they are close to the challenge colors and be sure to add CTD308 to the keywords section when you upload your cards to an online gallery so we can find your creations!! so adorable! I love those popsicles and don't want summer to end. So fun and cute. Love the little popsicles and fun colors. I'm with you...don't want to see summer come to an end either! These colors were so much fun and your popsicles are perfect for them! I bought that set with dies and have yet to use them. Smacking myself on the head for not using them with this challenge. 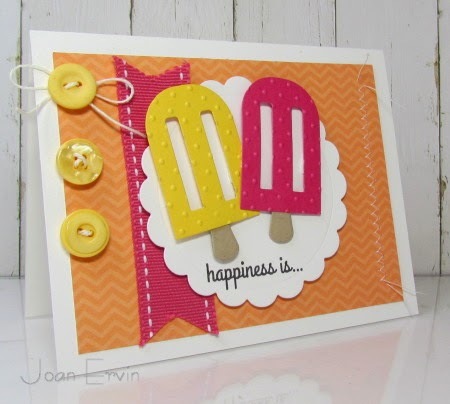 so CUTE.. love those ice creams..
Super fun card and great dies! The colors work perfectly! Adorable design and great colors = fab card!! Such a sweet card Joan. Love the yummy popsicles. The buttons and stitching look great. Oh, this is adorable...yes, I want to postpone fall too!! LOVED your colors and inspiration pic!! Love the bright colors and sweet design! Adorable! Popsicles and buttons, that's so fun! What an awesome job on the color challenge. Such a cute card. Hi Joan. This is one of my ultimate favorite color combos. Love those popsicles. Adoable :) love those popsicles !! Yummy card to match your yummy colors, Joan! CUTECUTECUTE! Those popsicles are too cute, Joan! Love the embossing on them, and the chevron background! How fun! I love those embossed popsicles. What a perfect summer design!